There are so many variations to this recipe that it's hard to cite just one source. This was definitely a dish that made it's rounds within the food blogging community. So I just took a few different variations and added my own variation too. I used both garlic and onion powder for additional flavor to impart in the butter topping. I also used spicy brown mustard, but you could use yellow mustard, Dijon mustard or perhaps a flavored mustard of your choice. And instead of adding poppy seeds to the topping, I used them as a garnish instead. For cheese, I used provolone but you can use swiss, cheddar, american, whatever you prefer! For the rolls, I used Hawaiian savory butter rolls but you can use homemade rolls, pretzel rolls, mini bagels, etc. 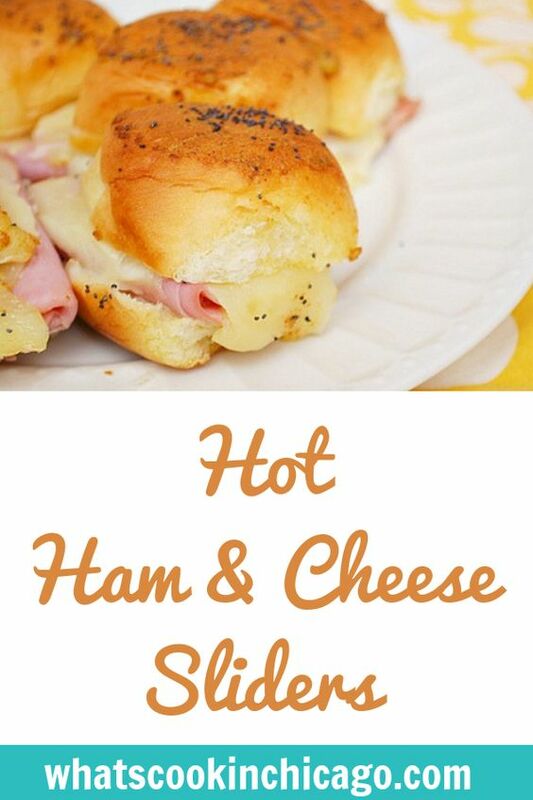 This is a great recipe to make your own using what you have or prefer so have fun with it! Spread butter onto both sides of the center of each roll. 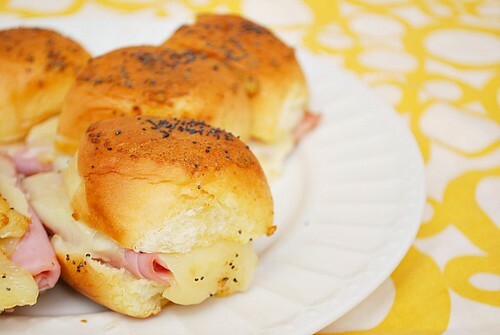 Place a slice of ham and a slice of provolone inside of each roll. Close rolls and place them close together into a large baking dish or heavy cookie sheet. In a small bowl, whisk together all of the sauce ingredients except for the poppy seeds. Pour evenly over all of the sandwiches, just enough to cover the tops. Sprinkle with poppy seeds and let sandwiches sit for 10 minutes to absorb the butter and seasonings. At this point, sandwiches can be assembled a day ahead, covered and kept in the fridge ready to bake. Cover with foil and bake at 350 degrees for 12-15 minutes or until cheese is melted. Uncover and cook for 2 additional minutes or until tops are slightly brown and crispy. Serve warm. Yum! This is total comfort food. My mom always makes these when we are all coming home for a late-night snack. This is a great recipe! These work really well for parties too!